Grades of raisins in the U.S. The color is good, and the flavor is characteristic of raisins. These raisins show development characteristics indicative of the fact that they are prepared from well-matured grapes (containing no less than 80% water by weight). The processed raisins contain less than 19% moisture by weight. The color and flavor is reasonably good. 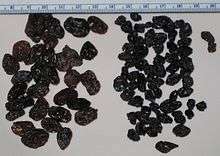 These raisins show development characteristics that highlight the fact that the raisins were prepared from reasonably well-matured grapes containing at least 70% water by weight. These raisins also contain less than 19% moisture, by weight. The color and flavor are fairly good. These raisins show development characteristics of raisins prepared from fairly well-matured grapes containing at least 55% water by weight. These raisins also contain less than 19% moisture, by weight. 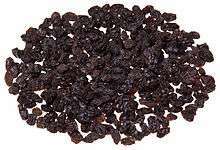 Raisins that fail to meet the standards of grade C.
The three types of drying methods are: sun drying, shade drying, and mechanical drying. 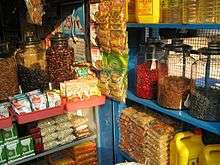 Sun drying is an inexpensive process; however, environmental contamination, insect infections, and microbial deterioration can occur and the resulting raisins are often of low quality. Additionally, sun drying is a very slow process and may not produce the most desirable raisins. Mechanical drying can be done in a safer and more controlled environment where rapid drying is guaranteed. One type of mechanical drying is to use microwave heating. Water molecules in the grapes absorb microwave energy resulting in rapid evaporation. Microwave heating often produces puffy raisins. 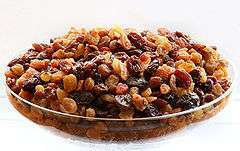 All steps in the production of raisins are very important in determining the quality of raisins. 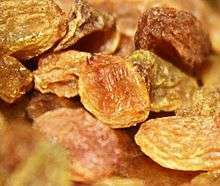 Sometimes, sulfur dioxide is applied to raisins after the pre treatment step and before drying to decrease the rate of browning caused by the reaction between polyphenol oxidase and phenolic compounds. Sulfur dioxide also helps to preserve flavour and prevent the loss of certain vitamins during the drying process. Raisins can be eaten as a nutritious snack, rich in dietary fiber, carbohydrates with a low glycemic index, minerals, vitamins, and other micronutrients. Their fat content is low. The overall nutritional value of raisins means they are recommended as a snack for both weight control and for maintaining good human health because they help the control of glucose, the good functioning of the digestive system and the regulation of blood pressure. Replacing unhealthy snacks by raisins in usual and moderate quantity can improve health biomarkers in patients with controlled type 2 diabetes. Adoption of this dietary habit may reduce diastolic blood pressure and increase the levels of plasma antioxidants in type 2 diabetic patients. Corinthian raisins are a moderate glycemic index fruit. They can be consumed in small amounts even by diabetic patients instead of sweets in a balanced diet. Antioxidants in Greek raisins may reduce the risk for malignancies in the stomach and colon. Thus, in a balanced diet, their antioxidants can help maintain the health of the digestive system. 1 2 3 Chiou, Antonia; Panagopoulou, Eirini A.; Gatzali, Fotini; De Marchi, Stephania; Karathanos, Vaios T. (2014). "Anthocyanins content and antioxidant capacity of Corinthian currants (Vitis vinifera L., var. Apyrena)". Food Chemistry. 146: 157–65. doi:10.1016/j.foodchem.2013.09.062. PMID 24176327. ↑ "USDA NDB Raisins". USDA. Retrieved 20 April 2013. ↑ "Nutrition Experts & Dietitians » California Raisins – The Wise Choice". Calraisins.org. 22 February 1999. Retrieved 16 January 2013. ↑ Bays, Harold E.; Schmitz, Kathy; Christian, Amber; Ritchey, Michelle; Anderson, James (2012). "Raisins And Blood Pressure: A Randomized, Controlled Trial". Journal of the American College of Cardiology. 59 (13): E1721. doi:10.1016/S0735-1097(12)61722-7. Lay summary – ScienceDaily (March 26, 2012). ↑ "Snopes.com:Raisins and grapes can be harmful to dogs". Retrieved 21 January 2011. 1 2 3 "United States Standards for Grades of Processed Raisins" (PDF). United States Department of Agriculture. 1 December 1978. 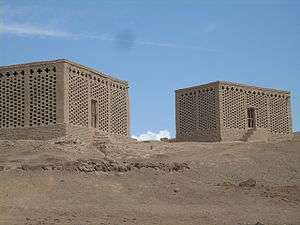 1 2 3 4 5 6 7 8 9 10 11 Esmaiili, M.; Sotudeh-Gharebagh, R.; Cronin, K.; Mousavi, M. A. E.; Rezazadeh, G. (2007). "Grape Drying: A Review". Food Reviews International. 23 (3): 257. doi:10.1080/87559120701418335. 1 2 3 4 Christensen, L.P., and Peacock, W.L. (20 April 2013) "The Raisin Drying Process". Raisin Production Manual, University of California. ↑ Kanellos, P. T.; Kaliora, A. C.; Gioxari, A.; Christopoulou, G. O.; Kalogeropoulos, N.; Karathanos, V. T. (2013). "Absorption and Bioavailability of Antioxidant Phytochemicals and Increase of Serum Oxidation Resistance in Healthy Subjects Following Supplementation with Raisins". Plant Foods for Human Nutrition. 68 (4): 411–5. doi:10.1007/s11130-013-0389-2. PMID 24114059. ↑ Kanellos, P.T. ; Kaliora, A.C.; Tentolouris, N.K. ; Argiana, V.; Perrea, D.; Kalogeropoulos, N.; Kountouri, A.M.; Karathanos, V.T. (2014). "A pilot, randomized controlled trial to examine the health outcomes of raisin consumption in patients with diabetes". Nutrition. 30 (3): 358–64. doi:10.1016/j.nut.2013.07.020. PMID 24262513. ↑ Kanellos, Panagiotis T.; Kaliora, Andriana C.; Liaskos, Christos; Tentolouris, Nikolaos K.; Perrea, Despina; Karathanos, Vaios T. (2013). "A Study of Glycemic Response to Corinthian Raisins in Healthy Subjects and in Type 2 Diabetes Mellitus Patients". Plant Foods for Human Nutrition. 68 (2): 145–8. doi:10.1007/s11130-013-0348-y. PMID 23564595. ↑ Kountouri, Aggeliki M.; Gioxari, Aristea; Karvela, Evangelia; Kaliora, Andriana C.; Karvelas, Michalis; Karathanos, Vaios T. (2013). "Chemopreventive properties of raisins originating from Greece in colon cancer cells". Food & Function. 4 (3): 366–72. doi:10.1039/c2fo30259d. PMID 23211994.